In China it is tradition to hold a Zhuazhou (dra-JO) to honor a baby’s first birthday. Zhuazhou dates as far back as the Song Dynasty (960 to 1279). During the ceremony, several objects are placed in front of the baby. The baby chooses an object without help from anyone. Each object is symbolic, and the object that the baby chooses foretells something about his or her future. For example, if a baby were to reach for a paintbrush that would mean that he or she will be endowed with great artistic skills. Peaches are a symbol of longevity or long life in China. Scientists at the Smithsonian’s National Zoo and in China have been studying giant pandas for more than four decades. If Bei Bei chooses the peaches it will mean he will be an ambassador for conservation for many years to come. The artwork was created by 16-year-old Yan Tong and the Chinese characters were written by 9-year-old Mengze Tang. 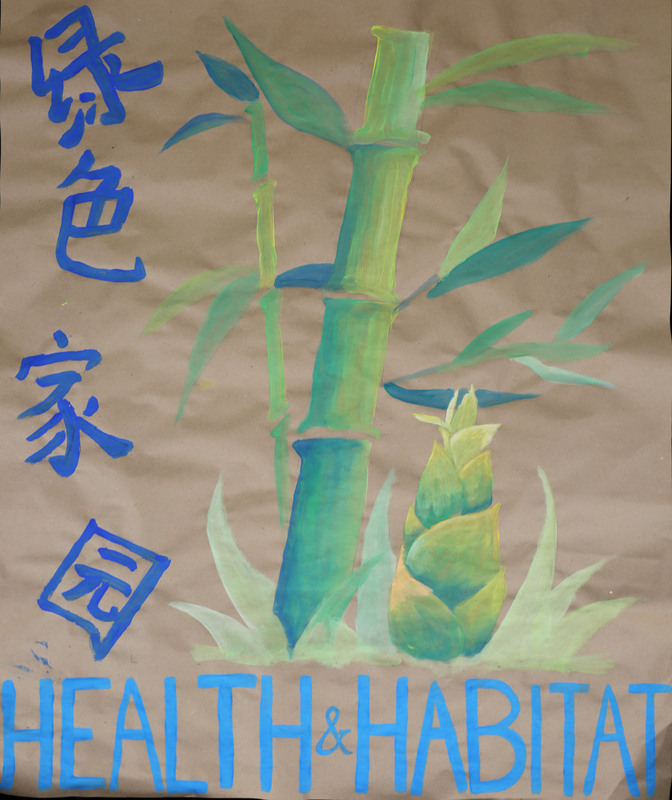 Bamboo represents good health for pandas, as it is their primary food source and covers much of their habitat. Giant pandas live in mountainous bamboo forests, and although they are carnivores, they have evolved to eat bamboo. If Bei Bei chooses the bamboo, he should have good health and thrive. The artwork was created by 16-year-old Yingzhe Liu and the Chinese characters were written by 11-year-old Mutong Qi. The Chinese Knot symbolizes luck and friendship. Scientists at the Smithsonian’s National Zoo and Conservation Biology Institute and scientists at the China Research and Conservation Center for the Giant Panda in Wolong, Sichuan Province, have been working together to learn about giant pandas and save them since the 1970s. This scientific collaboration will continue for decades to come. The artwork was created by 16-year-old Yingzhe Liu and the Chinese characters were written by 10-year-old Haoyang Zheng. Bei Bei was born Aug. 22, 2015 and is the third cub born to Mei Xiang (may-SHONG) and Tian Tian (tee-Yen tee-YEN). First Lady of the United States Michelle Obama and the First Lady of the People’s Republic of China Peng Liyuan named Bei Bei Sept. 25, 2015. His name means “precious” or “treasure” in Chinese and is complementary to his sister Bao Bao’s name. Bei Bei weighs almost 70.4 pounds (32 kilos). Bao Bao (BOW-BOW) was born Aug. 23, 2013, and is the second cub born to Mei Xiang and Tian Tian. She received her name after a public online vote. Her name means “precious” or “treasure” in Chinese. Bao Bao weighs 180 pounds (81 kilos). Mei Xiang was born at the China Conservation and Research Center for the Giant Panda in Wolong, Sichuan Province, China, July 22, 1998, and has lived at the Smithsonian’s National Zoo since 2000. She has birthed three cubs: Tai Shan (tie-SHON) who lives in China, Bao Bao and Bei Bei. Mei Xiang weighs about 240 pounds (109 kilos). Tian Tian was born at the China Conservation and Research Center for the Giant Panda in Wolong, Sichuan Province, China, Aug. 27, 1997, and has lived at the Smithsonian’s National Zoo since 2000. He has sired three cubs: Tai Shan, Bao Bao and Bei Bei. Tian Tian weighs about 275 pounds (125 kilos). Bei Bei, Bao Bao and Tian Tian will receive special frozen birthday cakes at 1 p.m. during the public celebration. The cakes were made by the Zoo’s nutrition department. Bei Bei’s frozen tiered cake was made with diluted juice and water tinted with food coloring. The red-and-purple tier was made with beet juice, the orange tier was made with carrot juice, the yellow tier was made with apple juice and food dye was used for the blue and green tiers. The number “1” topping the cake was made with apple juice. The red decorative appliques were made with slices of apple, pear, carrot, cooked sweet potato and leaf-eater biscuits—some of the pandas’ favorite foods. The bamboo decorating the cake is arrow bamboo, a favorite species of the pandas. The keepers also topped the cake with some honey for an extra special treat. At 1 p.m., the Zoo’s Department of Nutrition staff will place the cakes in the pandas’ yards. The Zoo will share the event as it occurs on social media through a Facebook Live broadcast. Guests will enjoy a taste of noodles prepared by the Chinese embassy. Dan Dan (dahn-dahn) noodles are served cold and known as a dish from Sichuan Province. It is a tradition for Chinese people, young and old, to have a bowl of noodles on their birthday because they symbolize ‘long life.’ Many restaurants in China serve special noodles to patrons celebrating their birthdays. In this case, the noodle is hand-made and there is only one tremendously long noodle in the bowl symbolizing ‘endless long-life and happiness.’ The China Conservation and Research Center for the Giant Panda in Wolong is in Sichuan Province. Guests will also receive a commemorative postcard for Bei Bei’s first birthday on a first-come, first-served basis. The postcard includes calligraphy of Bei Bei’s name in Chinese painted by 16-year-old Yingzhe Liu. 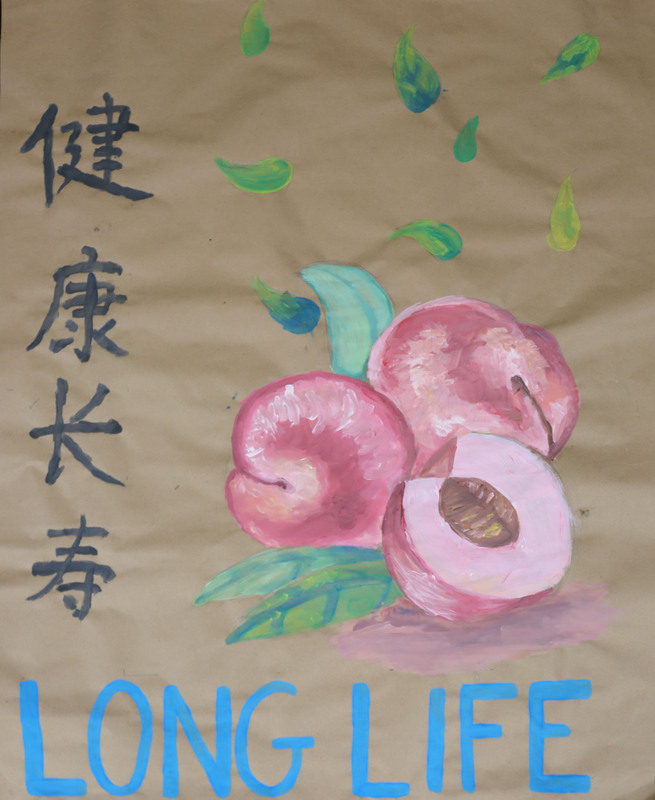 Peaches are a symbol of longevity or long life in China. Scientists at the Smithsonian’s National Zoo and in China have been studying giant pandas for more than four decades. If Bei Bei chooses the peaches it will mean he will be an ambassador for conservation for many years to come. 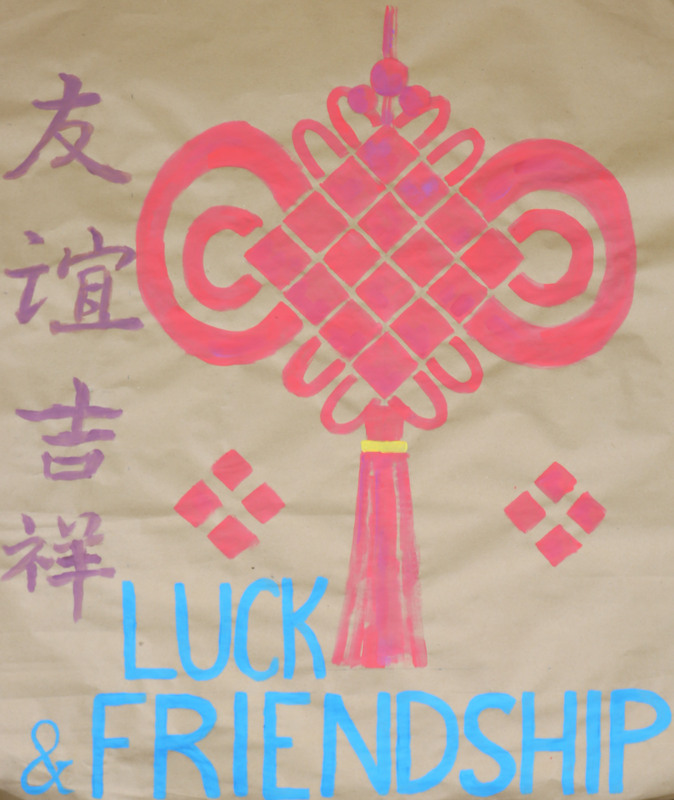 The Chinese Knot symbolizes luck and friendship.